The above info came from Vladimir, and was edited by yours truly (contact me). The image came from an untitled website. Kisara was a mysterious white-skinned girl who had the power of a white dragon sealed inside her. The only way the power could be released was if someone killed her. Kisara was saved by Priest Seth from a group of villagers who tried to kill her because they believed she was bad luck. When Priest Seth found out about the power inside Kisara, he refused to kill her out of his love for the girl. However, his father did it for him. When Seth almost got killed protecting her, Kisara's power was evoked and her soul transferred into the Blue-Eyes White Dragon. 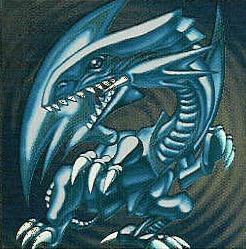 In the present, the Blue-Eyes White Dragon is a rare monster, as only four cards exist. Seto Kaiba, a confident duelist, deceived Yugi into giving him it, only to grudgingly give it back to Yugi after he was beaten. But once Kaiba took over his step-father's corporation, he searched for the other three Blue-Eyes White Dragon cards before he abducted Yugi's grandpa and ripped the man's card. Yugi avenged his grandfather by beating Kaiba again. But despite this defeat, Kaiba still relied on his three Blue-Eyes White Dragon and kept them in his deck, as his obsession with the Blue-Eyes White Dragon is similar to Seth's love for Kisara. Seto used various cards to summon them, such as Lord of Dragons and Flute of Summoning Dragon, or sacrificing two monsters. Blue-Eyes White Dragon can fire a blast of white energy called "White Lightening". Seto learned he could also merge all three of his Blue-Eyes White Dragon cards to create a stronger triple-headed version called the Blue-Eyes Ultimate Dragon. But the Blue-Eyes Ultimate Dragon can be sacrificed to summon the cybernetic-beast Blue-Eyes Shining Dragon. This monster's attack power is increased by 300 points for each Dragon-type monster in its player's Graveyard, and can negate all Spell, Trap, and Monster Cards that designate it. During Seto's duel with Pegasus in Duelist Kingdom, Pegasus managed to obtain use of a Blue-Eyes White Dragon and using the power of his "Toon World" magic card, turned it into the Blue Eyes Toon Dragon, a cartoon chibi-dragon monster just as powerful as its normal counterpart, only practically unkillable as long as "Toon World" exists. Seto considered the Toon Dragon as an abomination and nothing would make him change his mind about it. Blue Eyes is also a sort of motif for Seto Kaiba, who seems to incorporate the dragon into most everything in his life. Seto owns a jet modeled to look like a Blue Eyes. The entrance to Kaiba Land features three statues of the dragon, and the theme park also has a train car designed to look like Blue Eyes. As well, the Kaiba Land dueling arena is made to look like the head of a Blue Eyes. Blue Eyes is also one of the few cards Seto has used throughout the entire series, and is frequently used as an actual weapon. Seto often throws the card at enemies to distract them. And in season 2, Seto adopts a white coat, so with his white coat and blue eyes, he almost takes on the appearance of a human Blue Eyes White Dragon. The above description came from Vladimir, Dark_Yami_Girl, and fractyl2, and was edited by yours truly (contact me).